Saturday February 3: High of 80 today here south of Quartzsite, Arizona, and the sky is clear, for a change. We hear about the inclement weather in the rest of the country. While I am grateful we don’t have to struggle with the hardships of cold and snow, I do miss the beauty of wintertime. 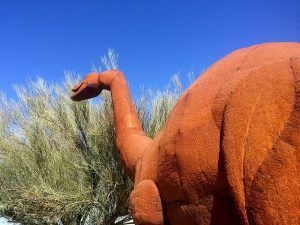 I go for an early desert walk this morning and then have breakfast with Rollie. Clifford is on his ham radio with the Early Bird Net. 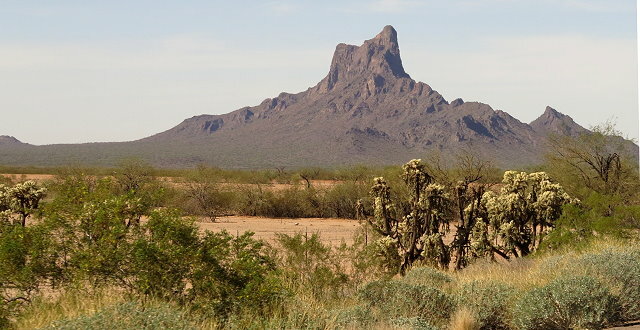 Later Rollie and I go for an exploratory drive, curious see what’s on down the La Paz Valley Road and find ourselves on the Old Yuma Road. We find more camping – some long-term and some 14-day-free areas. Good for future reference, but no great advantage over where we are now. Back at camp, I do some editing until the laptop battery goes dead and then prepare a spaghetti dinner. The wind has died down, so we make a campfire and eat outside. 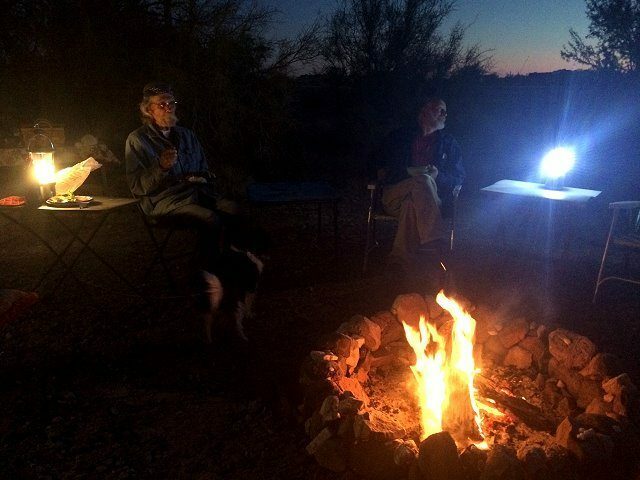 We haven’t had a campfire and eaten out very often here because of the wind, so it is a nice way to end the last day of our stay here at Roadrunner. Sunday February 4: Clifford is up at 7:30 and we soon start packing. It takes awhile, especially with the elaborate antenna and radio set up, but we are on our way by 11:00 a.m. after saying good-bye to Rollie. We’re headed to Tucson; he will be camping near Parker for a bluegrass festival there. Bill and Sally left for Montana a couple of days ago. It has been fun having family around. 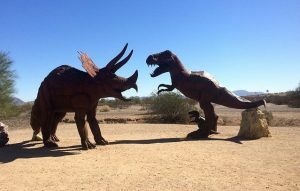 We stop in Gila Bend for gas, and I have to say this is a fun place to stop. As we near Tucson, we stop for a meal at Cracker Barrel, quite the treat, especially for me as I won’t have to fix dinner and do cleanup tonight. 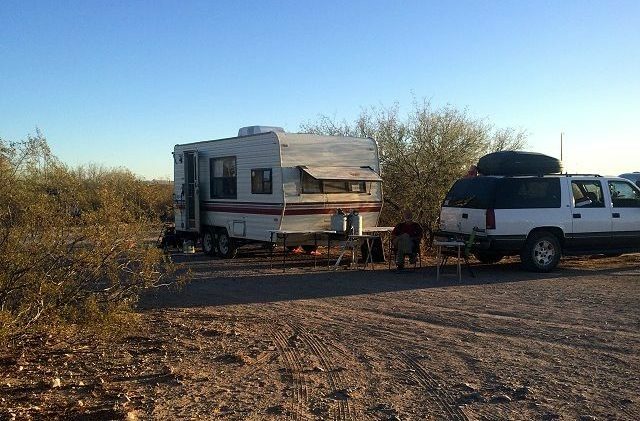 Then on to Synder Hill, the BLM dispersed camping area west of Tucson on Highway 86. 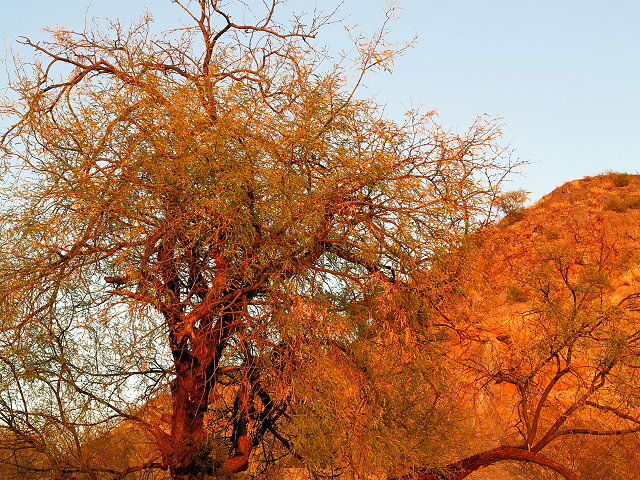 Synder Hill is just a few acres at the base of a hill, once outside of Tucson, but now surrounded by the expanding population. 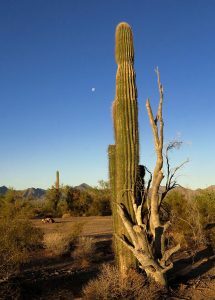 It is still a popular place for people who need a free and conveniently located place to stay while in the Tucson area. The nice spot we had last time is taken, as is every other nook. 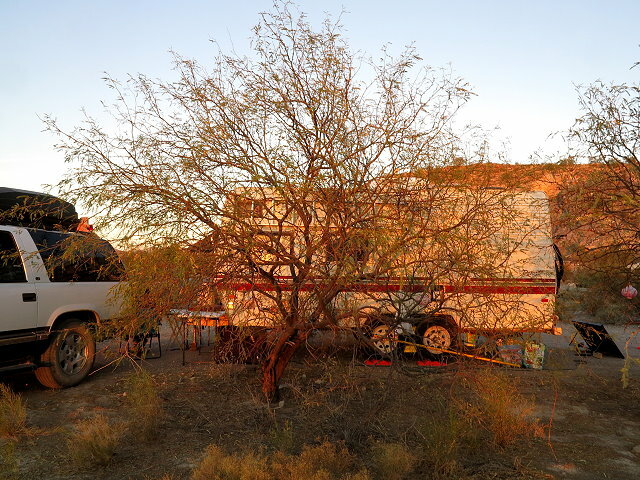 We settle for parking right on the side of the dirt road that meanders through the area, pulling in as close as we can to a little cluster of mesquite trees. We keep set-up simple, as we don’t plan to be here long and there is no room for anything other than simple, anyway. Play guitar a bit, but it is not nearly as much fun without Rollie on the mandolin. 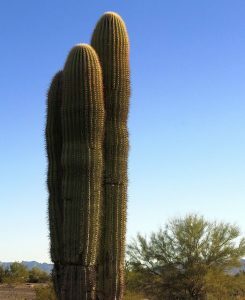 Monday February 5: Warm temps here in Tucson: 42/80. Living in Montana most of my life, I think of February as being the dead of winter. Not so here. We plan our errands for the day and the week so as to get everything done with the fewest trips to town. Today we are going to Southwest Strings, as Clifford wants to buy a viola for my birthday. 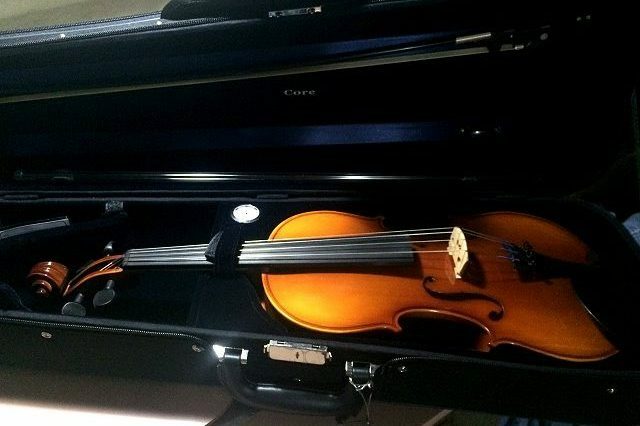 I have missed playing my cello, but a viola is small enough to take traveling and has a nice sound. It’s not a cello, but it could be fun. So off we go and spend quite a lot of time looking at the very small selection of violas in a size and price-range that will work. I’m not feeling drawn to any of them, so am willing to wait until we get to Santa Fe where I can go to the Violin Shop for better selection and more helpful assistance. However, now is the opportunity, so after asking if they have ANYTHING else, they bring out a couple more instruments… and one of them is better and will work. I buy a book of Fiddle Tunes for the cello, as I plan to read base clef on the viola. Why not? Same strings as the cello, just a higher octave. Back at camp, I begin experimenting with this new little instrument.